Bold. Powerful. 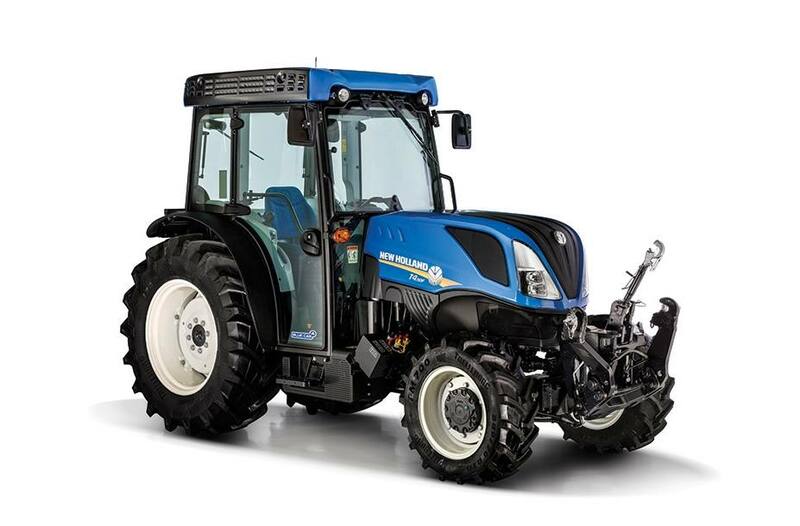 Narrow: From the world's leading supplier of narrow tractors, New Holland T4F Series narrow tractors combine more power and a bold new style with enhanced operator comfort and safety. All four models feature a sleek design that's ideal for the narrow rows of orchards and nut groves. 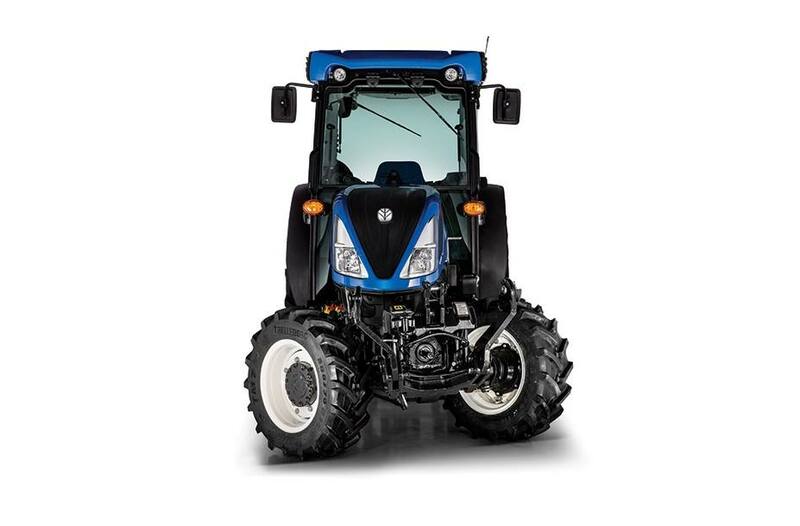 The standard SuperSteer™ FWD front axle makes these tractors extremely maneuverable. Or choose the economical 2WD front axle if you don't require the added traction FWD provides. 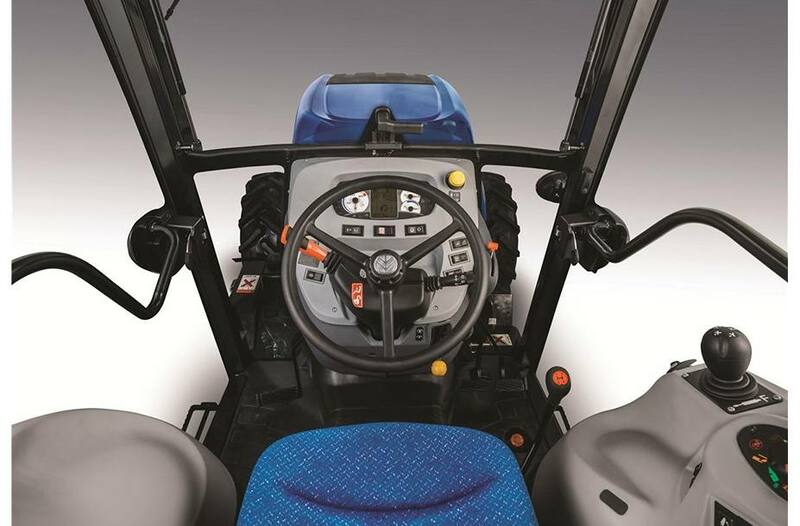 Powerfully Efficient: T4F tractors are packed with a powerful, 207-cubic-inch, four-cylinder engine built by Fiat Powertrain Technologies (FPT). These engines are Tier 4A emissions compliant, using a Cooled Exhaust Gas Recirculation (CEGR) system and Diesel Oxidation Catalyst (DOC). This common-rail fuel-injected engine provides higher engine power density and enhanced fuel efficiency and delivers constant max power from 1,900 rpm up to 2,300 rpm to ensure you have the best combination of power and fuel economy. 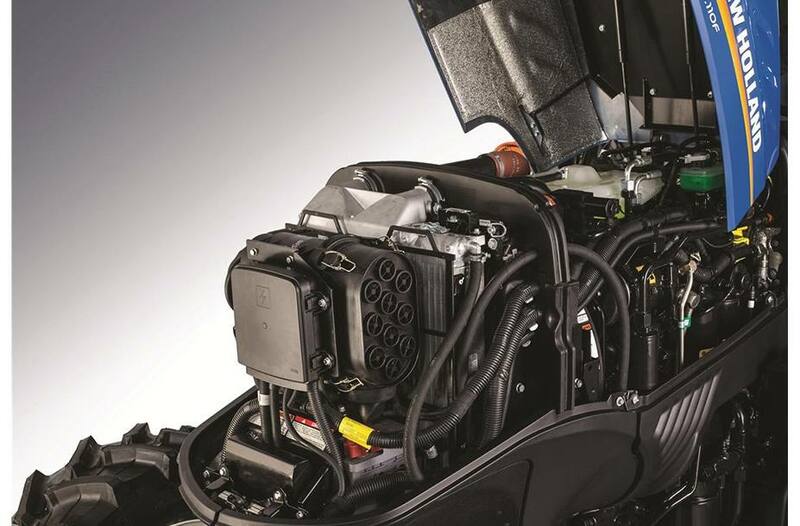 Additionally, the constant engine rpm feature ensures your engine rpms remain constant even under changing loads for applications where a constant PTO speed is required. More Transmission Choices: Choose the transmission that best suits your needs. 16x16 Synchro Command™ Transmission: Choose the 16x16 Synchro Command™ transmission with either a synchronized mechanical shuttle or a convenient power shuttle for easy, clutch-free forward/reverse shuttling. Easy Shuttling: The convenient, left-hand, column-mounted power shuttle lever leaves your right hand free to operate implements. 32x16 Dual Command™ Transmission: A 32x16 Dual Command™ transmission is also available. It provides the added convenience of a push-button high/low speed adjustment and foot clutch-free gear changes using the de-clutch button while shifting. All The Hydraulic Power You Need: T4F Series tractors provide and ample supply of hydraulic power so you can take advantage of large implements. Powerful Three-Point Hitch: T4F Series tractors come standard with a large rear hitch lift capacity of 4,045 pounds so you can maximize your productivity even with the largest implements. 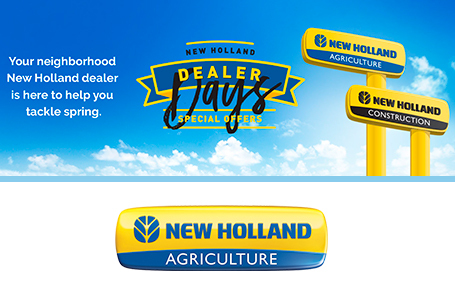 ROPS models come standard with the New Holland Lift-O-Matic™ feature that allows you to raise and lower three-point-mounted implements with the push of a button. Cab tractors come standard with Lift-O-Matic™ Plus, which offers the same great benefits by using an ergonomic lever. Additionally, cab models can be upgraded with an electronic draft control system to provide more precise rear hitch control. Available Front Hitch: A front three-point hitch with available front PTO is another option on all T4F Series models, providing you with greater versatility while operating between rows. The heavy-duty front hitch has a lift capacity up to 3,968 pounds. The redesigned front PTO gives you optimal performance with a purely hydraulic PTO clutch that is directly linked to the engine shaft. Dual-Pump Hydraulic System: The T4F hydraulic system uses two separate open-center hydraulic circuits to ensure full flow for operating implements, three-point hitch and other tractor operations. All models come standard with a 16.9-gpm implement pump, and two rear remotes, with the option to upgrade to three rear remotes with flow control on the number one remote. An optional 21.1-gpm implement pump is available in combination with electronic draft control, electronic mid-mount valve and joystick, and three open-center load-sensing rear remotes with one diverter valve on Cab models. The electronic mid-mount valve has four standard mid-mount hydraulic couplers plus two additional couplers that provide a dedicated hydraulic motor function offering 100% priority and a free return for orbital motor applications. The load-sensing rear remotes have eight total couplers, six standard couplers and two couplers that use flow diverted from the fifth and sixth couplers that enable you to operate four hydraulic outlets (only three simultaneously). 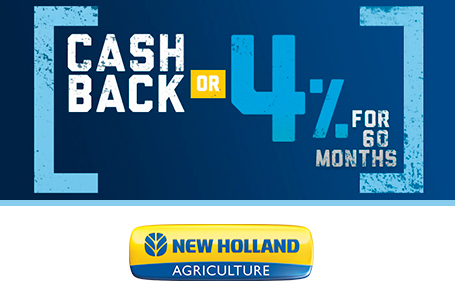 Tight Quarters Have Met Their Match: T4F Series tractors come standard with the patented New Holland SuperSteer™ FWD axle. This axle articulates as the tractor turns, combining the standard 55-degree steering angle with 21 degrees of axle articulation to provide an unmatched turning angle of 76 degrees—the best in the industry. That means you get the advantage of the shortest FWD row-to-row turning available. An economical 2WD front axle is available as an option for those who work in conditions where the extra traction of FWD is not required. 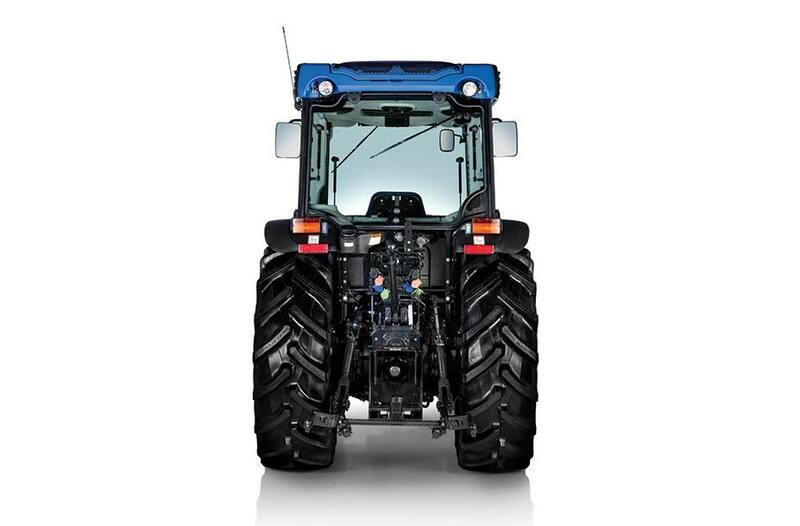 Automatic Traction Control: The SuperSteer™ FWD axle also includes the New Holland Tractor Management System that engages FWD only when needed for optimum traction, braking, and steering control. The system also monitors operation on hills to control loads when moving downhill, and engage FWD when extra traction is needed going uphill. You can also fully engage FWD to provide maximum traction at all times for extreme operations. 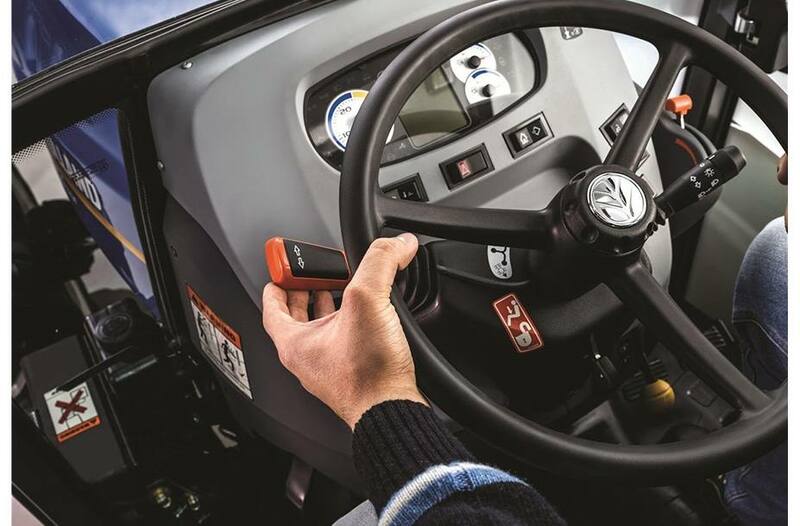 Operator Friendly: Take your choice of an open platform or one of the two Blue Cab™ options that offer different levels of operator protection to meet the needs of different applications. Both cab and open platform models feature isolation mounting for a smooth ride and less vibration. Upgraded instruments and controls provide maximum comfort and ergonomics. Standard Blue Cab™: The standard Blue Cab uses a higher-power fan for heat and air conditioning and a deluxe air filtration system that provides Level 2 dust protection. New Blue Cab™ 4: The NEW Blue Cab 4 technology enhances the deluxe features of the Blue Cab™ system providing cab Level 4 protection from dust, aerosols and vapors for the ultimate protection during spraying applications. This new system meets both EN 15695-2:2009 filter and EN 15695-1:2009 pressurization standards for operator protection. Blue Cab has an exclusive double filtration system that provides Level 2 protection until the operator chooses to engage Level 4 protection. Open Operator Platform: The operator platform is designed to keep you comfortable with more hip area and legroom, plus easy to reach controls and an adjustable vinyl seat. The mid-mount rollbar folds down allowing extra clearance under low branches or overhangs. 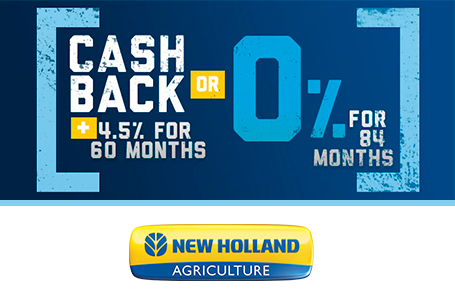 Get Under The Hood Quickly: The New Holland flip-up hood makes it effortless to access the engine for maintenance. Easy Access: It’s fast and simple to reach filters for maintenance.